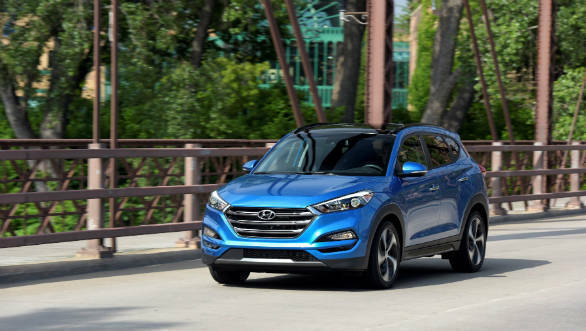 Hyundai has launched a new engine option for its mid-size Tucson crossover in the US market. This variant, called the Tucson Sport, is powered by a 2.4-liter four-cylinder engine that delivers 184PS and 237Nm. These are increases of 29PS and 45Nm respectively over the 2.0 litre petrol available in India. The Tuscon Sport is available in 2WD and 4WD options, both paired with the six-speed auto. The US-market 2018 Tucson Sport 2WD starts at $25,150 (Rs 16.37 lakhs) excluding taxes and duties, while the Sport with AWD has a starting price of $26,550 (Rs 17.28 lakhs), again excluding taxes and duties. Other standard features on the US-market car include 19-inch alloy wheels, blind spot warning, proximity key with push-button start, a leather wrapped steering wheel and shift-knob, and dual-zone automatic temperature control. It is to be noted that the Tucson Sport does not get a tighter suspension package, unlike the Elantra Sport. While there is no news on the availability of this engine in the Indian Tucson, the addition of a top-of-the-line naturally-aspirated petrol variant could make the car stand out among its rivals like the Jeep Compass and VW Tiguan. At present, the Tucson offers a decent package of comfort, refinement and car-like dynamics. The addition of this stronger motor could bring in some much needed excitement into the mix. This petrol motor also makes sense given the current increase in popularity of petrol cars among Indian buyers due to uncertainty over the future of diesel engines in the country and rising diesel prices.